Our company stands tall among the victorious Suppliers of Cinnamon Oil and offers the most lucrative deals to the customers. We have trustworthy and well-organized shipping facilities available, along with this, we keep a record of the same as well, and this increases our efficiency and gains the trust of the customers. To use Cinnamon Oil on your skin it must be diluted to 1%. That means 1% Cinnamon Leaf Oil to 99% Water. Do not exceed this level!Anything more and it will irritate your skin. Yes it is very tempting to put an extra bit of Cinnamon oil, but like Chili it gets hotter and hotter with time. So be very careful. Combine and transfer into spray bottle. Be sure to shake well before each application. A standard plastic spray bottle is fine, but small fine mister spray bottles also make excellent easy to carry dispensers. You are not going to die if you put 3% in the mixture, but anyone who has touched hot chilies and then touched their genitalia will attest, you will be hopping around on one leg for a while. Not to worry even at 1% it is very powerful. And shockingly effective. The best part is that Cinnamon Oil smells great. Now if you get tired of the Cinnamon smell you can add it to your sunscreen lotion or other creams. However doing so may reduce the effectiveness of Cinnamon as it's smell gets diluted with other scents. What makes it a good Mosquito repellent is its smell and the level of Eugenol content, a compound known to act as anti-bacterial and powerful insect repellant. Dilute the smell and the Mosquito's will bite you. Spray the diluted Cinnamon Oil solution on your clothing and your body. Use a fine spray mister. Cinnamon does not stain but you should test your clothing just to be on the safe side. Like sun block it goes without saying you should avoid the eye and mouth area. Use a pair of swimming pool goggles if you are spraying children on their faces. Do not apply to cuts. Spray Cinnamon Oil with a higher concentration (say 5%) on doorways and windows edges. This keeps the Mosquito's from coming indoors. In fact it will stop all other insects from coming indoors. If you are having a barbeque outside, then spray the general area. Create a perimeter. Spray it on open water sources. Wear light colored loose clothing to prevent Mosquito bites. This is because tight fitting clothes gives Mosquito's a good grip and closer proximity to the skin. Remove standing water near your house or spray all standing water with a squirt from our Cinnamon Leaf Bottle or you can dilute to 1% and use a pump spray to coat the water. 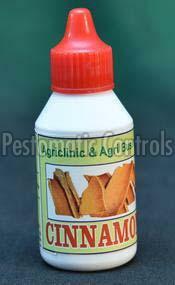 Please remember at the 1% Cinnamon Oil to water ratio it will not kill the Mosquito. It will merely repel them. Killing them instantly will require higher concentrations. Also remember Cinnamon oil need may need to be reapplied every few hours as the oil evaporates.